You may have noticed the US flags have been put up around the village. No, it's not for Flag Day, that's in June. The flags are up for Veteran's Day, which is Sunday, November 11. It starts off at 8:30 am at the Charlotte Jane Memorial Cemetery at 3650 Charles Avenue. 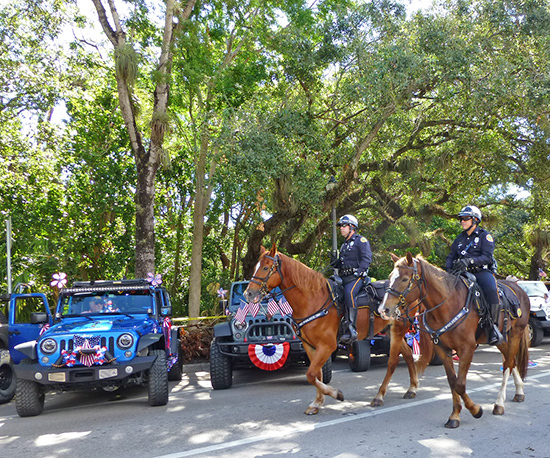 At 11 am, the Red, White and Blue parade starts at Grand Avenue and Matilda Street and marches to Armbrister Park. From 1 to 6 pm, there is the Coconut Grove Veterans Benefits Fair and Roots Salute Celebration at the Miami Fire College and Armbrister Park, 4000 Grand Avenue. For more info, please contact Comrade Alice Eason at 305-542-3320. This event is hosted by the Coconut Grove American Legion Post 182, City of Miami Commissioner Ken Russell and Honorary Host Committee Chiar Col. Emilio T. Gonzalez, USA Ret., Miami City Manager.